Food Blogga: It's the Beautiful Bones Round-Up! It's the Beautiful Bones Round-Up! Many thanks to you all of you who helped raise awareness of osteoporosis. Several people have emailed me to say that they just discovered they have osteopenia (a pre-cursor to osteoporosis) or osteoporosis and would like to start eating better. Well, to them and to all of you, I say, read on! There are 108 sensational, calcium-rich recipes that appeal to everyone from the beefiest carnivore to the greenest vegan. If I have missed anybody or made any errors, then please drop me a line in the comment box or email me at foodblogga (at) yahoo (dot) com, and I'll remedy it right away. I organized your entries into the following categories so it would be easier for you to search specific types of calcium-rich dishes. I also organized the entries within categories in the order they were received. To make the page load a little bit faster, I divided the round-up into two parts, so don't forget to check out Part Two here which includes main dishes, desserts, and drinks. DK understands that we all lead busy lives and that it can be difficult to plan calcium-rich, nutritious meals. Well, your worries are over with her creamy, healthy Fruity Flavoured Yogurt. Rich yogurt is studded with fresh banana slices, walnuts, dried dates, and dried prunes. Have it for a quick 'n hearty breakfast or great midday snack. 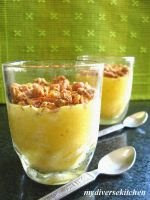 You know you'll have a great day when you enjoy Aparna's Mango Parfait with Homemade Crunch Granola for breakfast. Why? Because it's a satisfying blend of creamy, sweet mango and crunchy homemade granola that will keep your tummy happy for hours. Plus, doesn't "parfait" sound so elegant for breakfast? Miri is well aware of the risks of osteoporosis. That's because an estimated 50% of otherwise healthy Indian women over the age of 50 have low bone mass. So Miri makes sure that her diet is rich in calcium and vitamin D. Her homemade Pumpkin Walnut Bread is not only nutritious, it's also delicious because it's made from roasted sweet pumpkin, bananas, and walnuts. Is there a brunch item more versatile than frittatas? 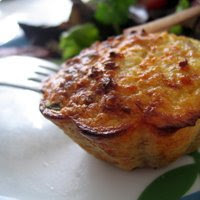 Betherann doesn't think so, which is why she loves this endlessly versatile Mmmmini Spinach Frittatas recipe. In fact, she encourages you to play around with different cheeses and veggies. But make sure to bake them in muffin tins like Betherann did, because they're just too adorable. Move over Mc Donald's Egg Mc Muffin. Food Blogga's Breakfast Egg Sandwich with Avocado and Chipotle Mayo will really help you kick off your day with a healthy does of calcium, protein, and Omega-3's. Mallory's go-to breakfast is her super-duper, calcium-packed Triple Threat Spinach Casserole. That's right. It's made with three cheeses--mozzarella, parmesan and cottage--for triple the deliciousness. In fact, it's so good, you might eat it for breakfast, lunch, and dinner. Next time you can't decide between ricotta hotcakes and French toast for a special breakfast, why not have both? You can with Heather's ingenious Ricotta Stuffed French Toast with Strawberries. After reading Heather's post, you may (like me) have an insatiable desire to go Italy just to get a mouthful of her neighbor's creamy homemade ricotta. Sarah has a knack for concocting baked goods that are both delicious and good for you. 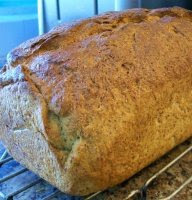 Take her latest bread creation: Wheaten Milk and Honey Bread is chock full of fiber, calcium, and protein. So skip the white bread, and make a loaf of Sarah's instead. Your morning toast will be something special. 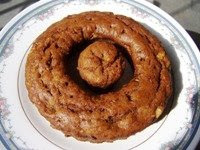 Homecooked and her husband buy banana nut bread every week at the farmer's market. 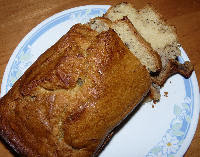 Last week, she decided to make her own Banana Nut Bread with buttermilk, bananas, almonds, and vanilla. After seeing this loaf, I don't think she'll be buying it at the farmer's market anymore. When the temperatures rise, how do you stay cool? Sandeepa eats a cool, luscious bowl of Beaten Rice with Yogurt, Bananas, Mangoes & Jaggery for Breakfast. This isn't just any sweet rice dish though, it's one that her Ma made every Tuesday during summertime. And though she's all grown up, Sandeepa feels like a little girl when she makes it and is filled with warm memories of her loving Ma. Cassandra is feeling pretty good about herself since she has successfully baked a lovely Quiche Lorraine. Not only is this quintessential brunch food endlessly popular, but it's also packed with lots of bone-building calcium. After hibernating during Canada's frigid winter, Bellini Valli is ready to hit the hiking trails and celebrate spring. And when she returns hungry from that fresh air and exercise, she'll dig in to this hearty and nutritious Mediterranean Artichoke Tuna Panini with Garbanzo Bean Spread. Though hosting a dinner party is enjoyable, it can also be time-consuming. 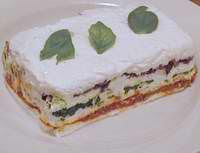 That's why make-ahead dishes like Ann's elegant Goat Cheese Terrine are such a saving grace. Just make it the day before, then sit back, relax, and await the kudos from your guests. Smita is infatuated with pomegranate molasses. Who could blame her? Pomegranate molasses--a condiment made from reducing pomegranate juice-- is a tangy, sticky, syrupy sauce that enlivens everything from a simple bowl of yogurt to a rich Middle Eastern stew. 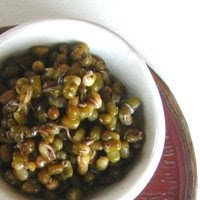 You'll be infatuated by Smita's lovely Sprouted Moong with Pomegranate Molasses. Sometimes simple really is the best. For Spicy Lovers understands this well, which is why she shares her Simple and Healthy Avocado Sandwich-- it's nutritious and tasty. Everyone knows how important calcium and vitamin D-rich foods are for building bones, but did you know that other minerals like copper and magnesium are also critical? Alka does, which is why she presents authentic Indian Paneer Burji (Cottage Cheese). Made with milk, butter, and cashews, as well as aromatic seasonings like masala and fenugreek, this is one healthy dish. Have you ever noticed at a cocktail party how everyone gravitates to the shrimp hors d'oeuvres? 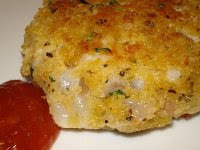 Well, people will swarm around Kara's crispy, fried Shrimp Cakes at her next party. Her secret: they're dipped in Panko breadcrumbs for that extra crunch. Susan should win a prize for "most calcium-rich re-do." 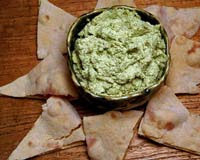 That's because her Edamame "Hummus" and Soy Whole Wheat Pitas, is made with edamame, which have 2 times the calcium of garbanzo beans and soy flour instead of wheat, which has 6 times the calcium! Oh, and did I mention her recipe also includes bone-building yogurt and sesame seeds? So eat up! 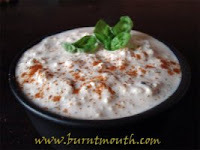 Zlamushka can always get a quick calcium fix with her nutritious and simple-to-make Tofu Dip. Just place the ingredients in blender, give it a whizz, and have yourself a healthy and tasty snack in minutes. What do you make for a dinner guest who is vegetarian and doesn't eat mushrooms, courgettes, or aubergines? Nilmandra prepared a Japanese feast that is as as nutritious as it is elegant: Hijiki Nimono (simmered Hijiki Seaweed with Edamame), vegetarian yaki udon, and vegetarian tofu and leek gyoza. 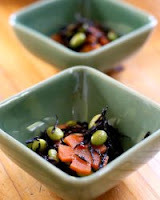 In addition to bone-building edamame, hijiki seaweed contains nearly 14 times more calcium than milk! I told you it was nutritious. Sweet cheesecake is universally loved, right? Well, Lore may make savory cheesecake just as popular with her Layered Crepe Savoury Cheesecake. After playing around in the kitchen, Lore created this unique dish of feathery light dill crepes, layered with a creamy filling of farmers' and feta cheese that is baked until golden and melty. When Maryann and her bloke get a touch of wanderlust, they hop in the Jeep and just drive. And isn't that the best way, really? No plans, no stress, just relaxation. Then they come home and enjoy a low-key yet delectable assortment of cheese and wine. It's the ideal carefree ending to an ideal carefree day. Like many of us, Sia finds cooking therapeutic. I know exactly what she means. When you get focussed on cooking (or baking, for some), you magically forget about all those pesky things that are bothering you. Since Sia has some pesky deadlines looming at work, she has found solace in making beautiful, savory Methi Thelpa (Gujarati flat bread made using fresh fenugreek leaves). Eating foods high in calcium has suddenly become a priority for Ricki. That's because unfortunately she just learned she has osteopenia--a thinning of the bones that is a pre-cursor to osteoporosis. 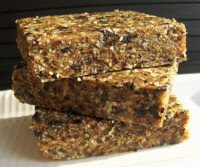 After experiencing some shock and indignation, Ricki did what any good blogger would do: she got busy in the kitchen making these protein and calcium-rich Raw Fig and Cherry Bars. They're a wonderfully satisfying any time snack and ideal travel food. Did you know that West Africa has significantly affected American cuisine? According to Bee and Jai, common American dishes such as gumbo and okra are West African in origin. Since we Americans love peanuts and peanut butter so much, it's not surprising that we also love dishes like Bee and Jai's African Kale, Pineapple, and Peanut Stew. 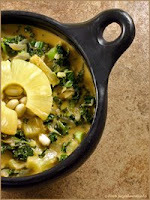 Earthy kale is paired with sweet pineapple and creamy peanut butter in this satisfyingly filling stew. Mansi loves everything about Thai food, especially their curries. 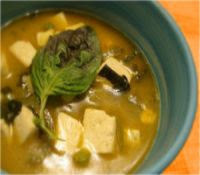 That's why she is sharing her recipe for Thai Soup with Basil and Tofu. A silky coconut milk and green curry broth is infused with a medley of Thai seasonings including tangy lemongrass and zesty kaffir lime rind. If you're feeling under the weather, then a steaming bowl of Suganya's bold, spicy Japanese Udon Tofu Soup is just what you need. Of course, since it's made with a lemongrass and ginger infused miso broth and chewy udon noodles, you'll be making it well after you've recovered. 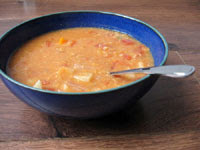 What's not to love about a warm bowl of comforting lentil soup? There's even more to love about Ashley's Choklay's Tibetan Lentil Soup since it's made with quick-cooking red split lentils and seasoned with bold cumin and coriander. Andrea is longing for the balmy weather that Virginia had a couple of weeks ago. Instead, she's staying dry inside while the chilly rain falls outside. And is there anything better than soup to warm your bones on a windy, wet day? Nope. 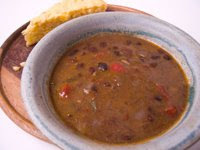 That's why Andrea made a batch of her hearty, delicious Slow-Cooker Black Bean Soup with Five Peppers and Ham. Anna reminds us that osteoporosis is often referred to as the "silent disease" since so many afflicted people do not realize they have it. In fact it's both shocking and sad that in Australia, someone is admitted to the hospital with an osteoporotic fracture every 8 minutes. 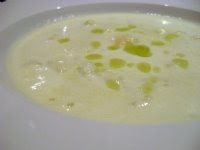 So Anna is vigilant about eating well and shares a recipe for nutritious and elegant Cauliflower Soup with White Truffle Oil. Pixie has been making her colorful Mexican Bean Salad for years. No wonder, it's is all about ease and versatility. Mix beans with your choices of healthy veggies and spices to create a comforting, delicious, and nutritious go-to-meal. Ivy and her family celebrated Easter in full fashion--they even roasted a lamb on a spit in their garage! Like many cooks who create lavish feasts, Ivy had lots of leftovers, especially eggs. So she added them to her hearty and nutritious Spring Salad. No one has to tell Maggie to eat her greens cause she loves 'em all, especially kale. After growing an exceptionally robust crop, Maggie couldn't get enough kale and white bean soup. 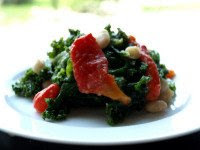 Now that the warm weather is coming, she'll be enjoying her light and cool Kale and White Bean Salad. Elly is giving osteoporosis a one-two punch with her calcium packed Santa Fe Chicken Salad. Believe it or not, one serving of this salad provides nearly 40% of your daily recommended calcium needs! Of course, you won't eat it just because of its impressive calcium content, you'll eat it because it tastes so good. Dhanggit says, "I think there is no secret to a healthy long life but good diet, exercise, healthy living and lots of happy thoughts." Adding her healthy Lentil and Feta Cheese Salad with peppery arugula and sugary beets wouldn't hurt either. 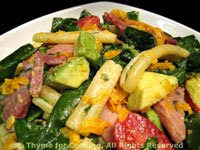 Katie's Salad with Spinach, Ham, Avocado, and Pasta will surely be a crowd-pleaser at your next your party or bbq. With hearty ham, creamy avocado, and chewy pasta, the only problem you'll have is running out of it too quickly! Who doesn't love summertime produce? 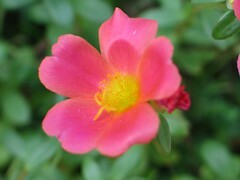 For Laureli, basil, more than any other herb, is the surest sign of summer. And with the warm weather rolling through Michigan, Laureli has already planted basil in her garden, which she'll use all summer, especially in her refreshing and healthy Soba Noodle Vegetarian Salad. Sarah gave herself a challenge: transform healthy but ho-hum brown rice into something exciting. 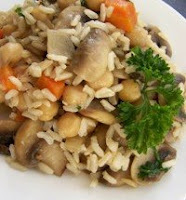 She has succeeded beautifully with her Brown Rice Pilaf with Mushrooms, Carrots, and Garbanzo Beans. Nothing ho-hum here. Beginner's luck or the polenta touch? 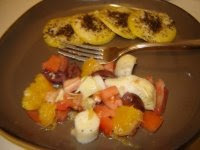 Smita's delicious Parmesan Polenta Rounds make a simple and satisfying week night meal. After one taste of these rich and creamy polenta rounds, you'll never want to go to a restaurant for it again. The verdict: Smita has the polenta touch. Fran knows only too well the risks of osteoporosis because sadly she has been diagnosed with osteopenia, a pre-osteoporsosis condition marked by the beginning of bone loss. So Fran is vigilant about getting an adequate amount of calcium and vitamin D in her meals, like this simple-to-make, deliciously creamy Polenta with Parmesan. Kate thinks grains are great. You can take her word for it because Kate knows what she's talking about. Millet is a delicate, mild flavored grain that is slowly gaining recognition in the US, and with recipes like Kate's colorful, crunchy Millet Salad with Corn and Peppers, it is sure to become as popular as quinoa in no time. Whole grains. Have you jumped on its bandwagon yet? If not, then you may want to start with simple-to-make, highly nutritious bulgur. Bulgur's chewy texture and nutty flavor are only enhanced by a medley of late spring vegetables and a warm fennel-honey-mustard vinaigrette in this Warm Bulgur Salad with Beets, Fennel, and Oranges. As a polenta purist, I'm usually skeptical about getting too fancy with it. But after seeing Rachel's amazing recipe for Polenta-Quinoa Sticks, I'm hooked. She takes the ultimate Italian comfort food, combines it with protein-rich quinoa, and form sticks, which she pan-fries until crisp, then smothers in gooey mozzarella and spicy marinara sauce. This is pure deliciousness. Suzana has taken quinoa-- the mother of all healthy grains-- and made calcium and protein rich Tuna Quinoa Muffins. These savory muffins are as attractive as they are nutritious. They make an ideal addition to any brunch buffet as well as a satisfying meal with a hearty bowl of soup or a salad. 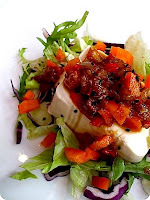 Nina illustrates simplicity and elegance with her Yogurt Cheese and Beetroot dish. Creamy, rich yogurt cheese is paired with earthy beetroot and drizzled with olive oil, fresh thyme, and orange blossom honey. Lovely. Everyone loves a 2-fer, right? 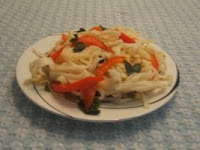 Then you'll love Tigerfish's post because she offers a 2-fer of delicious Asian vegetables. Make either water spinach or Spicy Long Beans in her rich, garlic-y shrimp sauce. Then again, why not make both? You'll appreciate the ease and deliciousness of Sangeeth's Vegetarian Delight. 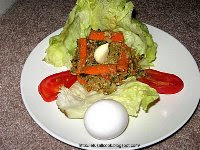 A healthy medley of vegetables are lightly cooked with eggs and seasoned with coriander. Don't eat eggs? No worries. Sangeeth suggests substituting creamy yogurt instead. Barbecue season is upon us, so fire up the grill for some Texas style beef bbq and Jaime's own Barbeque Baked Beans. 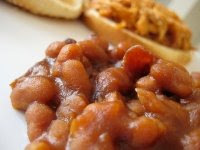 Made with molasses, brown sugar, and bacon, these beans are sweet, savory, tangy, and salty, just the way I love them. Now if I could only figure out a way to get invited to one of Jaime's bbq parties, I'd be all set. When, like Cheryl, you discover that you have osteopenia (a pre-cursor to osteoporosis) in your '20's, you realize pretty quickly how important it is to eat calcium-rich foods. 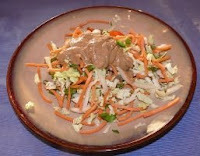 It's easy to do when the food is as delicious as Cheryl's Vegetable Medley with Brazil Nut Butter. Plus it's gluten free! What an amazing line up of fabulous dishes - I bet it took you days to put this together, well done and THANK YOU!! What an excellent round-up, Susan, not to mention, excellent idea to run the event in the first place. It was most informative (and fun to see that even food that might initially be frowned upon may turn out to be calcium rich after all). Even if I weren't concerned about having a well-balanced diet, I'd want to try just about every dish featured. What a great event! Susan, you really out-did yourself on this one. You can tell about the size of the turnout how well-liked & respected your are - all well-deserved. I think that your certainly achieved your goal of bringing awareness to Osteoporosis. I know that I'm shopping smarter in the grocery stores these days not only for myself, but also for my children to make sure that I do ALL that I can while they are still under my care. 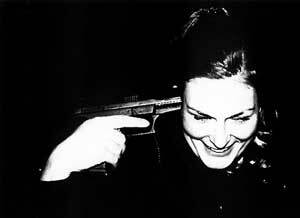 Thank you, dear Susan, for opening our eyes. We have all benefited from your food event. AND, I think we've all had fun at the same time too! Great event, great roundup, great dishes! What a wonderful collection of tasty dishes. Great idea for an event. Now I'm off to read part two. What a great roundup! All this food looks delicious! Healthy, yet tasty! Susan, and all bloggers! You are great! Susan, You truly did a beautiful round up here! Thanks for hosting a wonderful and informative event. You did everyone a great service with this event. And a fabulous variety of food. None of us has any excuses now not to eat healthy, not when healthy food can look and taste so good! I am sure you would have been hungry every time you received these gorgeous dishes. Thank you, Susan, for the event and the roundup. I did learn a lot about calcium rich foods. great reading, I have a lot of reading ahead of me. Wow, this is just an amazing collection. We really have a lot of choice of food to eat to prevent osteoporosis! I loved the combination of food from so many different countries. Fantastic round-up, Susan! There are so many delicious dishes here that I want to try...not to mention new blogs I get to visit. Thanks for doing this! You've done such a great job with organising this event! I have my eyes on quite a few delish recipes already, like quiche lorraine, the tofu dip, the mango parfait an the polenta-quinoa sticks. Susan you've done perfectly incredibly beautiful round up (parts 1 &2) really really beautiful!!! What a fabulous variety and wonderful dishes!! kisses and a have a nice day! thanks so much for your efforts--they all look awesome, and there's such a great range of dishes! Susan, What an amazing roundup! You make it look so effortless, and I know it's a lot of work to put this together. Thank you for bringing awareness to us, and all these recipes for us to try. I can feel my bones getting stronger all ready! What an impressive response! Thanks for putting this together Susan! Wow, what a wonderful collection of dishes! Great job on the round-up, Susan! I'm going to see the other page. What a great collection of food and a wonderful job on the round-up! Wow - so many terrific calcium rich recipes! Thanks for the roundup Susan. ejm-I know what you mean! amy-That's awfully kind of you. mansi-I'm so happy you like it! bal-I'm just glad that it helps inform people. chemcookit-I did too. So many authentic ethnic dishes to choose from. lyb-There are so many to try. elly-I know. I met so many wonderful bloggers. tanna-Thanks to everyone who participated, they made it easy. 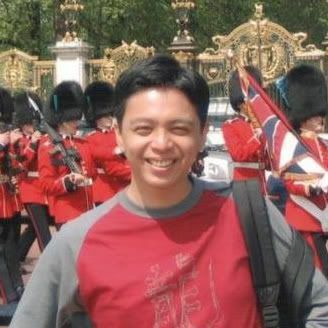 dhanggit-Oh, thank you so much! cheryl-There really is something for everybody. marie-Yay! That's what I want to hear. Okay - so I am a goof for not checking in and catching this fabulous round up! (round ups). Thanks for hosting such a great event. I forwarded the links to my mom so she can be aware of what she can cook to help her with her osteo. You're the woman!